Service Untitled» Blog Archive » Happy National Customer Service Week! DouglasOctober 03, 2007Little Things, Big Differences, Service Untitled Comments Off on Happy National Customer Service Week! I’d like to wish a very Happy National Customer Service Week to everyone. While I never advocate customer service being a weekly, monthly, etc. theme for your company (it should be permanent), there is nothing wrong with a week to recognize customer service. The official web site has some tips here. As my friend and fellow customer service writer suggests, just take a few moments and say thanks! Thanks to your customers, friends, employees, and so on. A post on how to write a thank you note. What to do about thank you notes if you have bad handwriting. 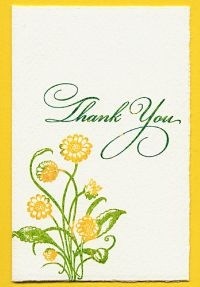 A sample thank you note for a customer or client. A short blurb and a longer half a post about customer service week from last year. Thank you for reading Service Untitled! Thanks for telling your friends and helping to spread the word. It has been (and continues to be) a lot of fun.